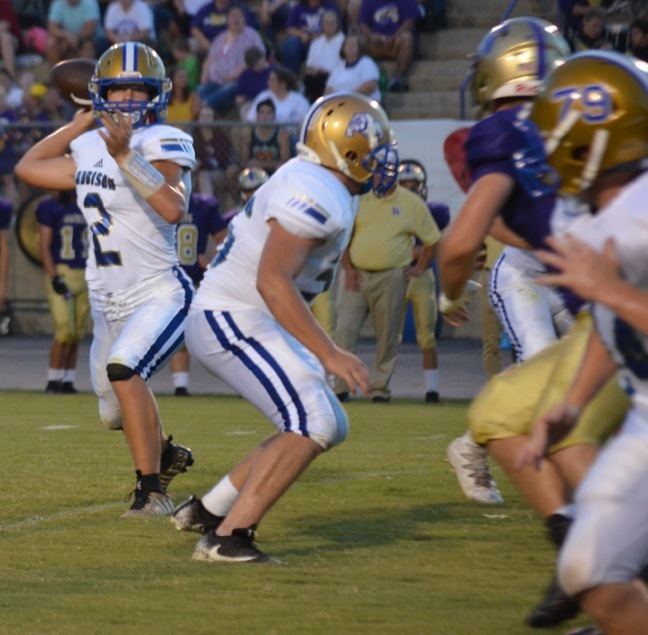 DOUBLE SPRINGS – A stout defense and a bruising ground game led the Addison Bulldogs (Class 2A, Region 7) to a 51-18 victory over the Winston County Yellow Jackets (Class 2A, Region 5) Friday night at Malcolm Blake Stadium in Double Springs. The contest between county rivals quickly turned in favor of Addison, as their defense stopped the Yellow Jackets on downs twice in the first quarter to supply the Bulldog offense with great field position. Starting at its own 47 midway through the first period, Addison marched to their first touchdown, covering the distance in seven plays. The final 5 yards came via a Zayne Guthrie rush around right end to give the Bulldogs a 6-0 lead. After stopping the Jackets on fourth down once more, the next Addison drive took only two plays. Grant Rice gained 3 yards on first down. Then Guthrie and Rice carried out a great play fake, with Guthrie keeping the ball and racing 43 yards for the score. The 2-point conversion put the Bulldogs up 14-0 with 2:21 remaining in the opening quarter. Addison promptly stopped Winston County's next possession and, after the punt, took over with another short field, starting at the Jacket 46. Five plays later, Rice ran into the end zone from 11 yards out, and the Bulldogs stretched the lead to 22-0. The Yellow Jacket offense then drove to the Addison 40 before the Bulldogs forced another punt. The kick finally pinned Addison to a starting position deep in its own territory, but Guthrie immediately negated any momentum the Jackets might have built, scampering 86 yards on the next play for his third TD of the night to give the Bulldogs a 30-0 halftime lead. After intermission, Guthrie would pick up right where he left off. The Bulldog quarterback scored on an 8-yard keeper to cap Addison's first possession of the half and extend the lead to 38-0. On Addison's next possession, the Yellow Jacket defense finally produced a spark of its own, as Ethan Moore intercepted a Guthrie pass and returned it down the left sideline to the Bulldog 11. Four plays later Brooks Bonds scored on a quarterback sneak from 2 yards out to give the Jackets their first points of the game. Addison came right back, with Rice scoring on a 6-yard run off left tackle, and the third quarter ended with Addison up by a score of 45-6. The fourth quarter featured one more Rice rushing TD, this time from 3 yards out, sandwiched between two Yellow Jacket scores. The first came after a 12-play drive, with Bonds scoring on a 3-yard run. The big play in the drive was a 31-yard pass from Bonds to Cade Taylor, who made a diving, one-handed grab. The final score came on a 38-yard run by Jacket sophomore Trey Williamson with 2:30 remaining, to make the final margin 51-18 Addison. The Bulldogs gained 390 yards rushing for the game, with Guthrie totaling 146 and Rice 120, each on eight carries. Addison returns home next week to host Red Bay, while Winston County travels to Tarrant.